It is a huge surprise to many that the gay community is involved in rodeo, but this being America and the fact that all of us are intrigued with our Western heritage, it only adds to the reality "We are everywhere!" The gay community has found many creative ways to become involved with America in efforts to overcome the walls of prejudice. The "Imperial Court" system, which is active in many cities across America, asked their "Empress and Emperor" to raise money for charity. It was felt that raising money for the "Muscular Dystrophy Association" would make a statement for both our existence and our concern for our neighbors. Emperor I of Reno, Phil Ragsdale, came up with one of the most creative ideas to raise funds. The year was 1975 and Ragsdale wanted to help out the local Senior Citizens Annual Thanksgiving Day feed. An amateur gay rodeo would be fun, raise money, and even erase a lot of gay stereotyping. Ragsdale did not find it easy to pull off this event. He did finally land the Washoe County Fairgrounds for October 2, 1976 and then could not get any local ranchers to allow gays the use of their animals. Finally, on October 1, 1976, he was able to locate five "wild" range cows, ten "wild" range calves, one pig, and a Shetland pony. The next day, "IT WAS RODEO TIME!" Over 125 people took part in this "first" event and the winners were crowned; first, "King of the Cowboys," second, "Queen of the Cowgirls," and third, "Miss Dusty Spurs" (the drag queen). It was great fun and a minor success. Ragsdale added several new twists to the 1977 version of this rodeo/fundraiser. He founded the Comstock Gay Rodeo Association and his rodeo project became the National Reno Gay Rodeo. Following the Imperial Court’s lead, Ragsdale added the "Mr., Ms., and Miss National Reno Gay Rodeo" contest to benefit the Muscular Dystrophy Association. The 1977 rodeo, although still small, with its new twists donated 4.00 to MDA under the name of "Reno Gay Liberation." The National Reno Gay Rodeo became a total new outlet for the gay community and created a dual party, "emerging Gay Liberation mixed into a Country/Western party" and "24-hour casinos." Dance troupes from the gay community found an arena to show off their stuff. Square dancing, clogging, formation line dancing, and the rebirth of the two-step made the nights into fabulous parties! By 1980 a group out of California, the "Pacific Coast Gay Rodeo Association," had emerged with talented rodeo contestants. Fresno, California and Utah had presented some of the top contenders for the Mr., Ms., and Miss titles. Gay rodeo, and the parties surrounding the event, had gained a great foothold in America. Texas was the big state in 1981, bringing a host of fans in Texas T-shirts, a hot contender for All-Around Cowboy, and Mr., Ms., and Miss contestants, who by the way raised nearly ,000 for MDA. The Miss from Texas won the competition for Miss National Reno Gay Rodeo. With San Francisco only a short drive away, the underground gay network spread the word about this "party" and the audience in the grandstands grew to 10,000. Those who only came for the nightlife swelled the head count of gays in the city to over 40,000! 1982 was dominated by Colorado and brought another change to Ragsdale’s rodeo: contestants who wanted standardized rodeo rules so they would feel that they were competing on an equal basis. Many contestants from the previous five years did not return for competition. The Mr., Ms., and Miss National Reno Gay Rodeo contestants were no longer comfortable raising large numbers of dollars just for MDA. Texas in particular was disappointed in this area and decided not to return in 1983. So 1983’s version of Mr., Ms., and Miss National Reno Gay Rodeo allowed contestants to designate 50% to MDA and 50% to a gay-related charity of their choice. Most chose the AIDS Foundation. 1983 also saw the largest number of dance groups ever assembled at a gay rodeo and the grandstands filled with over 12,000 people. The lack of consistent rules continued to create problems in the arena. By 1984, the ninth and final National Reno Gay Rodeo still brought over 10,000 people to the rodeo grounds and thousands more to Reno for the gambling and nighttime parties. The IRS credits the demise of this rodeo to a dispute with Washoe County Fairgrounds and the Sands Hotel along with the purported seizure of the rodeo books. Nonetheless, Phil Ragsdale had made a major mark on gay history and introduced the renowned Rose Maddox and Joan Rivers to the emerging gay-Western lifestyle and kindled the flame in the hearts of many men and women scattered across the nation. Across the nation, the gay community began to set the tone for the "Urban Cowboy" phenomenon. Beginning in 1980, a popular disco called "The Broadway" in Denver introduced Country/Western nights with Ron Jesser teaching the two-step. It became so popular that the club dropped its disco format and catered strictly to this new country crowd and changed their name to "Broadway Country." The city of Denver and the changing need for government buildings brought the "Broadway Country" to a roaring halt in January 1981 when the city gained control of the property for a new Justice Building. Denver’s two-steppers were still hungry for a place to "do their thing" and one of the most ardent fans gambled his world to bring a country dance floor back to the gay community. John King opened "Charlie’s" in Denver in early June of 1981 and the urban cowboys were again happy. The underground gossip chain rumored that country bars were springing up all across the nation and believe it or not, a gay rodeo in Reno, Nevada. A handful of adventuresome cowboys from Denver decided to check it out and even if it wasn’t true, Reno had great casinos. It proved true and a couple of the men even became contestants. The boys from Denver saw an unbelievable mass of gay humanity coming together in Country/Western celebration. A couple of groups from San Francisco introduced Square Dancing (The Foggy City Squares), clogging (The Barbary Coast Cloggers) and a line dance called "Kaw-Liga." Rose Maddox belted out a theme that the gay community dearly loved, "Stand By Your Man." Everywhere you looked, the Pride of Texas was in front of you with great looking T-shirts and loads of enthusiasm. They had raised nearly ,000 for Muscular Dystrophy and their Miss candidate even won the title of Miss Reno National Gay Rodeo. At the closing party in a jam-packed room at the Sands Hotel, the newly crowned Miss Reno National Gay Rodeo (Miss Texas) came face to face with Wayne Jakino. He couldn’t move left or right and felt compelled to congratulate Miss Texas. She responded, "Thank you, and where are ya’ll from?" Jakino said he was from Denver and Miss Texas chided, "Well, ya’ll might as well of not shown up from all we have seen of you." Jakino let his mouth overload and snapped, "Yeah, but check us out next year!" Excited about the Reno weekend, Jesser asked John King if Charlie’s would allow a group to meet to talk rodeo. The first meeting saw Jesser, Jakino, and seven other men commit themselves to form the Colorado Gay Rodeo Association (CGRA) and return in force to Reno. In just a little over a month, on September 13, 1981, the new association elected its first officers, with 42 people present, and make its first public appearance at a community fundraiser that evening. Jakino was elected Founding President and his memory burned with the taunting from Miss Texas. It was now "Reno or Bust!" time. It should be noted that the argument over placing the word "gay" in the name of the association had raged for a month before the election and for two months following at every bylaws ratification meeting. Founding membership was held open on December 1, 1981 and hit 94 founding members. Thereafter, membership continued to climb. Surprisingly so, for historical purposes, this new rodeo group didn’t even own a horse! The next ten months were frantic and filled with enthusiasm. When August of 1982 rolled around, 270 CGRA members and over 150 supporters wearing shirts emblazoned with the slogan "Colorado Rides With Pride" arrived for the Reno National Gay Rodeo! This time they even had horses! The entourage included the first mounted gay drill team, the Mile High Square Dancers, the Denver Country Cloggers, candidates for the Mr., Ms., and Miss titles, and 43 rodeo contestants, which comprised two-thirds of the contestants for that rodeo. Colorado contestants quickly learned that the rules of the rodeo arena changed from one minute to the next and learned from other returning contestants that this had been true in the past. The contestants voiced a wish for uniform rules in order to improve the quality of rodeo and more rodeos in which they could hone their skills. Why not? A new challenge! Start another rodeo! Colorado returned home and talked rodeo. Practicality clearly indicated Colorado had not raised the amount of money that Texas had and additionally, Texas had a huge population base and an emerging political climate that Colorado could not match. Colorado picked up the gossip from the underground network that there were great Country/Western bars with urban cowboys operating in Dallas, Fort Worth, Houston, Austin, and San Antonio. Having already made a few Texas friends in Reno, CGRA decided the road to another rodeo led through Texas. A Colorado delegation headed south in the fall of 1982 determined to talk Texas into forming an association and hosting a rodeo. Wayne Jakino, Rich Rezac, John King, and Kenny Cunitz arrived in Houston and headed for "The Barn." Walter Strickler and Terry Clark operated the club. Both men had been very involved in the efforts to bring Texas to Reno. The "Brazos River Bottom" was the hot country-dance bar and the target for added support in the rodeo effort. Discussions were positive, but Houston leaders were very hesitant to go forward. The official answer was, "You stage a rodeo in Colorado and we will work hard to support you." If you ever bump into Rezac, Cunitz, or the security guard from the Allen Park Inn in Houston, be sure and ask about the "Ester Williams Midnight Synchronized Diving Exhibition!" The Colorado delegation was not discouraged. San Antonio and the much-talked-about "Snuffy’s Saloon" were just up the road. Ron Weaver and Swampy were great hosts and Snuffy’s was hopping, but the official answer was, "You stage a rodeo in Colorado and we will work hard to support you." The city of Austin was a short drive away, but the group hit this one cold turkey. The target was called "The Red River Crossing" and the people were really friendly. After a really good time, there was no official answer, but some really nice people said, "If Colorado does stage a rodeo, we will sure come to see it!" Okay, so Fort Worth and Dallas were just up the road! A stop at "The 651 Club" in Fort Worth netted support from some really helpful cowboys and they escorted the group over to Dallas. It took all of two minutes in "The Roundup" to meet Tom Sweeney and Richard Montgomery. The Roundup was "The Mecca" for the "Urban Cowboy" and everybody was ready to rodeo, but not in Texas and not after Colorado had talked to Houston first. Colorado did get a very sincere official answer, "You stage a rodeo in Colorado and we will work hard to support you." The delegation headed home to Colorado fully convinced. If the five largest cities in Texas were coming to the Colorado Rodeo, it was time to start organizing. CGRA had little problem getting a vote of approval from its membership to stage a rodeo so the committee went to work. To be politically correct, the rodeo needed to be two months in front of the Reno rodeo, since that one was called the "National" Reno Gay Rodeo. As sort of preliminary competition and hoping to provide ownership of an event to a much larger area, the rodeo was established as the "Rocky Mountain Regional Rodeo." Everything was rosy, except that CGRA could not land rodeo grounds. The answer was a flat "NO" or more delicately phrased, the answer was, "and we would be delighted to book your rodeo. What date were you wanting?" or "Oh, that date isn’t available!" Nor was any other date for the next ten years. Only days before the decision to postpone the rodeo, an attorney called with the cryptic message that Aurora, Colorado had a "non-discriminating" clause on the use of it’s parks and that an unknown and run down little arena existed on the eastern edge of that city. History records June 3, 1983 as the date that the Denver metropolitan area became the second location in the United States to stage a gay rodeo. As promised, Texas arrived with major support and additional contestants from California trekked across the country for the first Rocky Mountain Regional Rodeo. Torrential rains hit the rodeo, but too much effort had been spent to let a little water stop the festivities. Colorado’s membership topped 390 by rodeo time. Terry Clark and Walter Strickler asked the original Colorado delegates to return to Houston for the Gay Pride Celebration in late June 1983. If Colorado could provide the books from their rodeo validating that the rodeo had not lost money, they would invite all interested individuals in Texas to attend a meeting to form the Texas Gay Rodeo Association (TGRA). The Gay Pride Celebration was a success with a reported crowd of 54,000 lining the streets. The vote to proceed to form TGRA was also a success. Within a few short months, Texas banded together a network inside their largest cities and forged the framework for a multi-city organization. A November 1984 date was targeted to stage the first TGRA rodeo and the search began for rodeo grounds, which were finally located in Simonton, 35 miles outside of Houston. Texas became the third state to stage a gay rodeo. The "Urban Cowboy" phenomenon also appeared in California in the early eighties. While Fresno and the Bay Area were the most visible at the Reno rodeos, a loosely organized group called the "Pacific Coast Gay Rodeo Association" provided contestants for both the Reno and Colorado rodeos. Hundreds of men and women attended the Reno rodeos, but the man with the burning desire to organize California was in Long Beach. Al Bell opened "Floyd’s" in Long Beach, which became one of the best Country/Western bars in the Greater Los Angeles area. Bell and Pat McGrath traveled to Reno and Denver and became hooked. As we saw in Colorado and Texas, a mere handful of enthused people is all that is needed to put life into a new association. Bell invited folks from CGRA and TGRA to visit and McGrath leaped into organizing "Floyd’s Cloggers," later to become one of the best-known dance troupes in the nation. 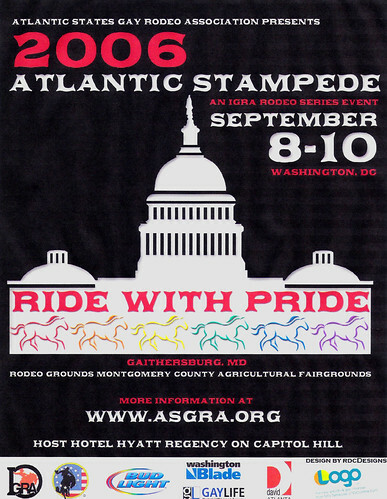 The Golden State Gay Rodeo Association (GSGRA) officially organized in 1984 and set a rodeo date for the following March. The Los Angeles Equestrian Center, located in Burbank, became the site for the fourth state to host a gay rodeo. Dozens of dance teams from around the nation performed to huge crowds. Things were also shaking in Phoenix as early as 1982, when a small group traveled to the Reno rodeo and Tish Tanner won the title of Miss Reno National Gay Rodeo. Arizona would come to life in the fall of 1984 when King decided to open a second "Charlie’s" in Phoenix. The bar opened in early November and since King and Kenny Cunitz lived and breathed rodeo, it was only a matter of weeks before the Arizona Gay Rodeo Association (AGRA) formed. In December 1984 the new group targeted January of 1986 for their first rodeo. Arizona became the fifth state to host a gay rodeo and the event took place in the most unique arena facility on the south side of Phoenix: a Mexican Charro rodeo arena with an attached dance hall known as the Corona Ranch. Would Gay Rodeo Have a Future? With four rodeos now scheduled and more contestants joining each day, Jakino felt that an umbrella organization was needed to provide unity between the rodeos and fully standardized rules for the contestants, as well as guiding the growth of gay rodeo’s future. Leaders from Colorado, Texas, California, and Arizona were invited to Phoenix for a preliminary discussion. Jakino and Jesser from Colorado, Clark and Strickler from Texas, Bell and McGrath from California, and King and Cunitz from Arizona all agreed to proceed to organize the umbrella organization. The Articles of Incorporation of the "International Gay Rodeo Association" were filed in Colorado and the four associations met again in March of 1985, in Denver, and elected a temporary board with Jakino presiding. A formal convention date was scheduled for September of 1985, again in Denver, to standardized rodeo rules and plan objectives for growth. The "Urban Cowboy" syndrome was alive in Oklahoma, too. Les Krambeal and Walt Rupprecht had been to Reno and owned a great bar in Oklahoma City called "The Bunkhouse." Krambeal made contact with CGRA members and asked for guidelines to help organize the Oklahoma Gay Rodeo Association (OGRA) in the summer of 1985. When Krambeal learned that there was a scheduled convention to finalize a new organization in Denver that September, both Krambeal and Rupprecht lit every fire necessary to prepare the framework for OGRA and made plans to appear at this convention and ask for recognition of their state association. OGRA was accepted at the IGRA convention in Denver and truly became the unabashed joyful child of the rodeo world. Friends from Colorado went to Oklahoma City often and OGRA’s enthusiasm was contagious. By the fall of 1985, Oklahoma announced they had scheduled a rodeo for July 1986. With ten years of gay rodeo history already in the record books, a gathering of rodeo junkies gathered to formalize the future of gay rodeo in Denver in September of 1985. Nine months of preparation already had been invested in efforts to assure the continuity, growth, and heritage of the Country/Western lifestyle in the gay community. Colorado, Texas, California, and Arizona were each represented by five delegates. The convention opened by recognizing the newly formed Oklahoma Gay Rodeo Association and their four delegates. The five founding states of the International Gay Rodeo Association (IGRA) elected Jakino as their Founding President and formally adopted the Articles of Incorporation in the state of Colorado. They ratified the bylaws, approved events, standardized rodeo rules, and committed the organization to the fostering of national and international amateur rodeo and other equestrian competition and related arts, crafts and activities which encourage the education on or preservation of "Country/Western" lifestyle heritage. During 1986, interest in gay rodeo continued to grow and Oklahoma passed their enthusiasm into surrounding states. The second IGRA Annual Convention in Denver welcomed and seated the Kansas Gay Rodeo Association (KGRA), the Missouri Gay Rodeo Association (MGRA), and the New Mexico Gay Rodeo Association (NMGRA). This convention also approved a new framework for the IGRA bylaws to allow future growth. They also accepted a bid from California to host the first IGRA Finals Rodeo in Hayward, California at the end of the 1986 rodeo year. This entry was posted in Colorados Future and tagged Association, Intl, Rodeo. Bookmark the permalink.